By 1969 multiple solo and group exhibitions, both Canadian and international, had firmly established Jean McEwen's status as a significant member of Canada's art scene. That same year, he was named a member of the Royal Canadian Academy of Arts, and he exhibited his series Corps à corps at Galerie Godard Lefort in Montreal. Corps à corps à fleur de rose is a compelling example from this important period in McEwen's career. His brief foray into hard-edge abstraction can be seen at the edges of the canvas, where beige stripes create boundaries to the rose and taupe centre. The dappled surface of this centre reminds us of the many layers of pigment contained within its soft, cloud-like forms, which in their movement create a sense of dimensionality. In deliberate contrast, the flatness of the margins, which pull to the front of the picture plane, underscores the inherent two-dimensionality of the painting. 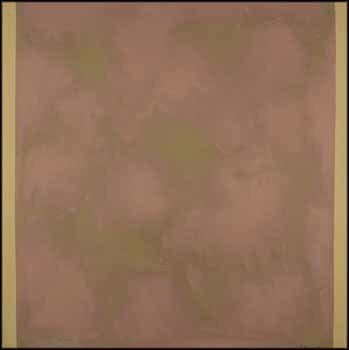 A similar canvas from the same series entitled Corps à corps à fleur de violet is in the collection of the Vancouver Art Gallery.